Here is a collection of articles that will help you understand and better explore Longji Dragonback Rice Terraces. 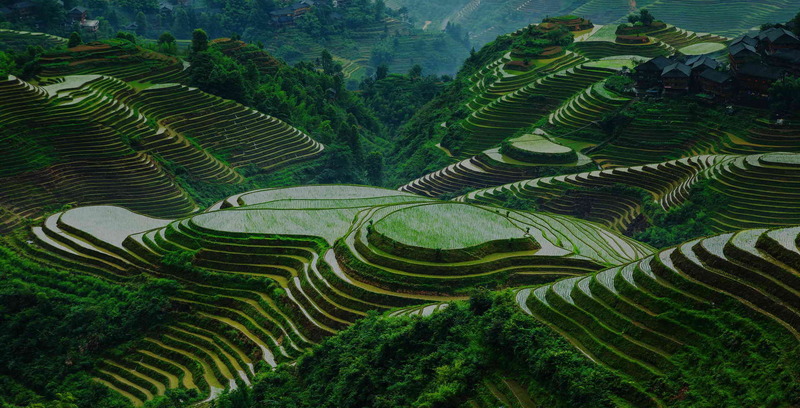 While Yangshuo has endless acres of emerald green rice fields, Longsheng, Longji and Ping'An, just 90 minutes north of Guilin feature spectacular terraced fields on steep hills, known as the Dragon Back rice terraces. From the Yangshuo Mountain Retreat, the best way to visit is to get up early and take a taxi through Guilin, visit the terraces then fly out from Guilin airport in the evening. You can also spend the night in Ping'An village. Yangshuo Mountain Retreat reception can help you plan this trip to make the most of your Yangshuo Guilin tour. Many of our guests have raved about the Li An Lodge in Long Sheng. It's more expensive than the nearby accommodation but our guests say it's a good value. If you require more information on Li An Lodge, you can read their reviews on TripAdvisor. Yangshuo Mountain Retreat can also help you book accommodation with them. Longsheng is situated about 200 km northwest of Yangshuo. Longsheng itself is not a particularly interesting town but the area that surrounds it has some of the most beautiful mountain scenery in Guangxi Province. About 25 km from Longsheng, in the lower slopes of the mountains, you can find minority cultures living in villages nestled in between the ancient rice terraces. The major minority groups here are the Miao and the Dong. Once you are in the national park (100 RMB entry/person at time of writing) it is a 5km steep climb by bus from the riverside to the main village called Ping'An. This minority village is over 300 years old and in the wooden lodges 200 families are still living in harmony with nature. The bus drops you off slightly below the village so you will have to walk about 15-20 min to reach Ping'An and another hour to get to the first of many view points from which you can see the breathtaking Dragon's Backbone Rice Terraces. The scenery of large wooden lodges on stilts, cascading rice terraces that disappear into the valley below and the magnificent backdrop of 2000 meter mountains is always an unforgettable holiday experience. The rice terraces are beautiful in every season. In summer the paddies are a lush green and the rice sways in the gentle breeze, in autumn they turn a golden yellow, in winter they are often blanketed in a light covering of snow and in spring the waterlogged rice fields sparkle in the sunlight. Go and explore it in your own time with the Yangshuo Mountain Retreat's individual day trip. Spend the rest of the day exploring Ping' An and the terraces at your own leisure. Walk to one of the many terraces that look out across this amazing vista and soak up the breathtaking views. The Longji rice terraces are comprised of two separate but closely located areas: the Ping'An terrace fields, and the JinKeng terrace fields, each with their own villages and hamlets within easy walking distance. Ping'An terrace fields are comprised of Ping'An village, and two smaller hamlets, and is a Zhuang minority inhabited area. JinKeng terrace fields comprise DaZhai village, as well as 5 smaller hamlets, including TianTou village higher up the mountain. JinKeng is predominantly or completely Yao minority inhabited. Arrive near the end of May, and witness the fields full of water as the first stage of growing rice begins. Dawn and dusk are particularly breathtaking, as pools of flooded emerald rice fields mirror the sun's rays. For the past 10 years, we have referred our guests to the Li An Lodge, designed and owned by Keren Su, a renowned Chinese-American photographer. Sitting on top of a mountain, bordering a local village and overlooking magnificent rice terraces, Li-An Lodge is an entirely wood structure implementing the Chinese traditional building technique of tongue and groove without a single nail. The lodge was created by Keren Su, a renowned photographer, painter and adventurous world traveler, who discovered this enchanted location during a photography trip in 1997. It took him 8 years to design and finish this one-of-a-kind lodge, where Chinese tradition meets modern luxury. Overlooking the Longji Dragonback Rice Terraces, in every season the terraces present a different beauty. Open a window of the room and find a panoramic view of the amazing landscape. Several trails from the lodge lead to other scenic spots and local villages. From Guilin, drive north on G321 or G76. Enter Longji Terraced Fields and arrive at parking lot of Ping An Village. Hike uphill 25 minutes to reach L-An Lodge. For other locations, our driver can take you to any specific place with advance reservation. Call us at +86 773 8777 091 or email us here. Longji weather is similar to Guilin, though coolder due to elevation. Summers range from lows in the high teens to highs in the mid 30's celcius, with intermittant showers throughout the afternoons. October brings drier weather and cooler evening temperatures in the mid teens while days are in the mid-20's. Winter sees frost at night and daytime temperatures in the single digits to low teens. The rainy season begins in May, when daytime temperatures are in the high 20's. For more information on Longji weather, call Yangshuo Mountain Retreat at +86 773 8777 091 or email us here.